The new version features a significantly improved user interface. The connection list provides much more detailed information about the connections including: selected proxy server, matched rule, connection status with color indication, x64 and IPv6 mark, user name and process ID. All additional information is displayed only when needed so UI remains clean and easy to read. Proxifier log messages are now more detailed, including all new parameters listed in the above paragraph. Additionally a number of new messages were introduced. Now Proxifier can be configured to output DNS requests, rules processing messages and more. Verbosity of the output can be changed via the Log menu. It is possible to set different log levels for screen and file output and the log file directory is also configurable. The new version features a new, fresh and much more flexible user interface. You can even create your own configuration of panels or change visual appearance (View‑>Application Look). The core Proxifier configuration has been significantly redesigned and improved. Now you can specify independent multiple proxy servers in (Profile->Proxy Settings...). It is also possible to create multiple proxy chains and manipulate them via the new UI. The new version allows you to assign different proxies/chains for different rules (Profile->Proxification Rules...). 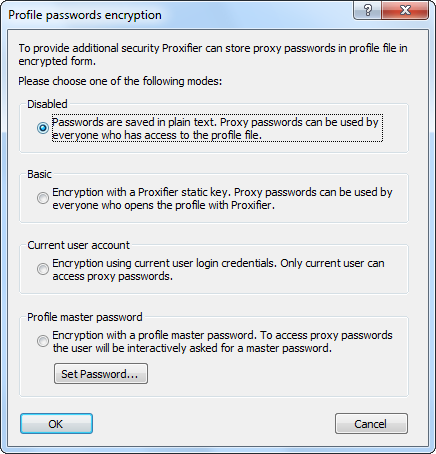 Thus each rule has an individual action that tells Proxifier to process the connections through a proxy or chain, to block the connection or to open it directly. Rule configuration has been redesigned to be much more comprehensive and flexible. Applications and target hosts can be specified as wildcards (e.g. inet*.exe, 192.168.1. *, etc.). XML format of profile files (*.ppx). 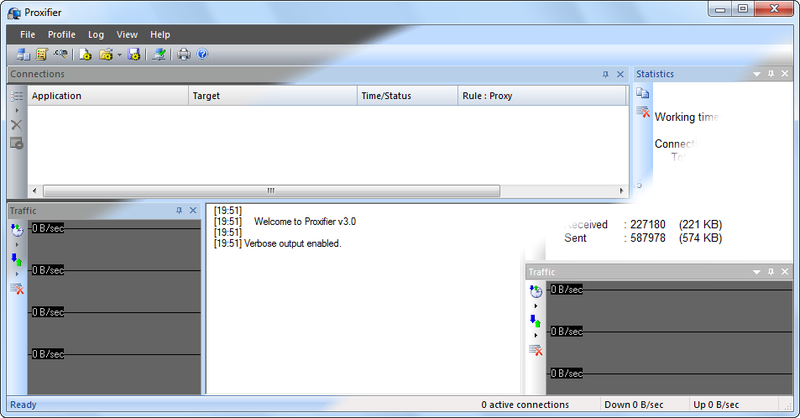 Proxifier v3 fully supports IPv6 protocol and x64 applications and systems. Everything works out of the box. No additional configuration is required. Transparent NTLM authentication with current user credentials is supported. All character processing is now based on Unicode. Proxifier works well with any international strings and fonts. The new version is fully compatible with the latest versions of Windows operating system and benefits from the features available on Windows Vista, Windows 7 and Windows Server 2008. We also did our best to ensure maximum backward compatibility. It is still possible to run Proxifier on Windows 2000. The Proxifier network module has been rewritten to support Windows Services and applications being run by other users on the computer (Profile->Advanced->Services and Other Users...). 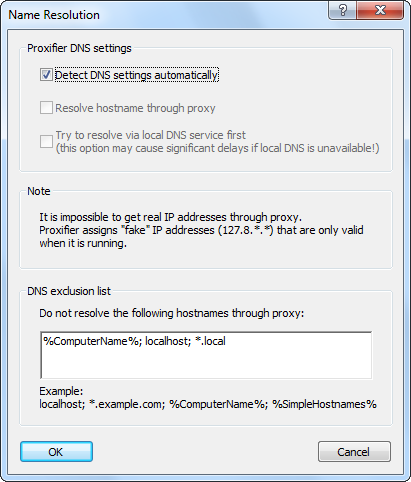 Now you can specify the hostnames that should be resolved with local DNS when Proxifier is configured to process hostnames through a proxy. This feature is useful when you need to work with LAN and Internet connections at the same time. Version 3 features a number of other improvements. Overall the user experience has been significantly improved. We did our best to ensure maximum compatibility with third-party software, especially firewall and antivirus packages. The new version is much less likely to cause software conflicts.